Gaming systems and small form-factor (SFF) PCs have turned out to be growth segments in a desktop PC market that has been subject to severe challenges recently. Many vendors have tried to combine the two, but space constraints and power concerns have ended up as performance-limiting factors. Zotac, in particular, has been very active in this space with their ZBOX MAGNUS series. Starting with the ZBOX MAGNUS EN980 (Intel Core i5-6400 / GTX 980), they have been on a regular release cadence - in mid-2016, we saw the EN1080 with an updated Pascal GPU, and the CPU upgrade to Kaby Lake in the EN1080K came to market in Q3 2017. All these systems carried a hefty price tag befitting a boutique vendor. However, the performance of the systems with their excellent liquid-cooling solution did justify the pricing. In order to expand the appeal of the ZBOX MAGNUS series, Zotac has now started experimenting with fully air-cooled systems in the same form-factor. The ZBOX MAGNUS EK71080 that we are looking at today is a Kaby Lake system using a Core i7-7700HQ processor along with a discrete NVIDIA GTX 1080 card. It is the flagship fully air-cooled configuration in the Kaby Lake generation. It looks likely that Zotac will be adopting this cooling strategy for the flagship ZBOX MAGNUS models in the future also. In terms of internals, after discounting the thermal solution, the only major difference compared to the ZBOX MAGNUS EN1080K that we reviewed earlier is the replacement of the Core i7-7700 with a Core i7-7700HQ processor. The pricing is also much lower - there is a difference of $400 between the MSRPs of the EK71080 and the EN1080K. While the performance of the CPU-limited workloads is expected to lag a bit, GPU-limited workloads and gaming should not see much of an impact. There are a number of other tradeoffs (some good, some disappointing) that we will be looking at throughout this review. 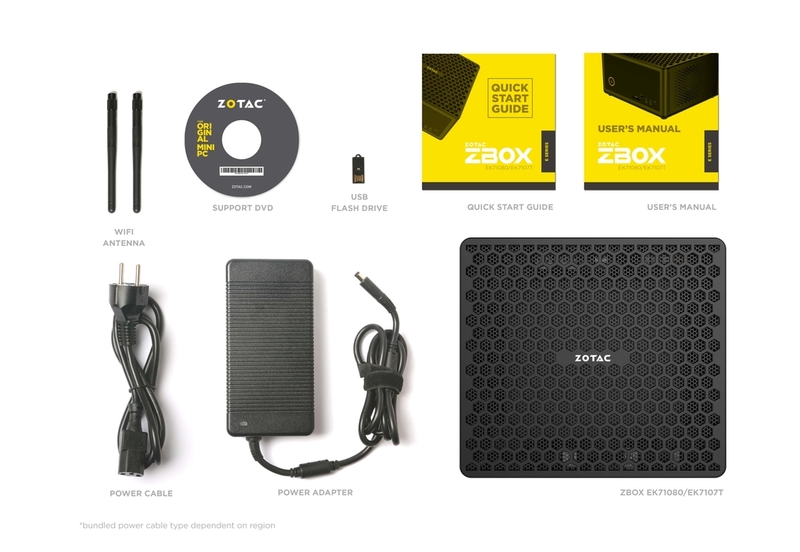 The Zotac ZBOX MAGNUS EK71080 claims to be a powerful VR-ready gaming mini-PC that is equipped with a powerful notebook processor and a high-end discrete GPU. In terms of physical footprint, the EK71080 is similar to that of the EN1080K (5.85L / 225 mm x 203 mm x 128 mm). Unlike the impressively quiet liquid cooling system in the EN1080K / EN1080 / EN980, the EK71080 relies on a number of fans spread throughout the chassis. On the external front, the orientation of the ports in the rear panel is different - the four USB 3.0 Type-A ports are all aligned horizontally (they were stacked vertically in the EN1080K). The EN1080K / EN1080 / EN980 all use a MXM card, and the display outputs are routed through the mainboard. Those systems also have a front HDMI port and fancy RGB lighting for the chassis (controlled using the Spectra utility). This is not the case with the EK71080. The video outputs are from a discrete card, and the front HDMI port is not available. The chassis doesn't have the RGB lighting feature either. One of the advantages of going with a lower TDP CPU (the 45W Core i7-7700HQ instead of the 65W Core i7-7700) is that the PC requires only a single power brick - a 330W (19.5V @ 16.9A) DC power supply. In addition to the main unit and the adapter, the package also includes a US power cord and WLAN antennae. A quick start guide with installation instructions for the memory and disk drives, a user manual and a read-only USB key with the drivers round up the rest of the package. It must be noted that the EK71080, like the EN1080K, is Intel Optane-ready. As we shall see further down in this section, the underside of the board has a second M.2 PCIe 3.0 x4 that specifically supports Optane drives. With Intel RST, an Optane drive can be used as a caching drive for either the main M.2 SSD or the disk installed in the 2.5" slot. We received the barebones version of the ZBOX MAGNUS EK71080 from Zotac. In order to complete the build, we used the same components that were used in our EN1080K review - two 16GB Corsair Vengeance DDR4 SODIMMs and a 512GB Toshiba OCZ RD400 M.2 2280 PCIe 3.0 x4 NVMe SSD. The Corsair SODIMMs can operate at up to 2667 MHz, and we were able to get that speed in the EK71080 (compared to the 2400 MHz and 2133 MHz for the same SODIMMs in the EN1080K and the EN1080 respectively). The Toshiba OCZ RD400 operates with the full PCIe 3.0 x4 bandwidth. Note that OCZ's custom NVMe driver is needed to obtain the best performance out of the SSD. The specifications of our review configuration are summarized in the table below. In addition to the above, we also have the PCIe lanes corresponding to the Optane slot. The use of the HM175 chipset allows Zotac to offer the Intel I219-LM gigabit ethernet controller for one of the LAN ports. The second LAN port is still enabled by the Realtek RTL8168 (similar to the other ZBOX MAGNUS PCs we have looked at before). The other nice upgrade in the EK71080 is the USB 3.1 controller. The new ZBOX uses the updated ASMedia ASM2142 controller (compared to the ASM1142 used in the EN1080K and earlier PCs). The other components such as the audio codec (Realtek ALC892), Wi-Fi (Intel AC3165), and the SDXC card reader (Realtek-based USB 2.0 bridge) are the same between the EK71080 and the EN1080K. The gallery below shows some photographs of the chassis and the internals of the system. It also includes a breakdown of the thermal design from Zotac's product page. Even though the photo only shows two radial fans, the chassis itself has another fan on the side, and the underside has a small fan to aid in cooling any installed M.2 SSD. Our evaluation was done with the launch BIOS ( Version 2K170911 ), which, unfortunately, doesn't have the latest Kaby Lake microcode from Intel for patching the recent security vulnerabilities. However, we used Windows 10 Enterprise x64 Build 16299.334 for our benchmarking. It integrates the software fixes for the vulnerabilities. Essentially, our benchmark results correspond to a patched OS-only configuration. The various options available in the BIOS are covered in the gallery below. While we do have the option to enable SGX support, there are no control knbos for the integrated GPU in the Core i7-7700HQ. The integrated GPU is better at decoding videos encoded in codecs such as VP9 Profile 2 compared to the GTX 1080. It can offer the PAVP (protected audio video path) for certain DRM requirements that is also not present in the GTX 1080. Unfortunately, the integrated GPU is completely disabled in the EK71080 (this is no different from the previous ZBOX MAGNUS PCs, though). In the table below, we have an overview of the various systems that we are comparing the Zotac ZBOX MAGNUS EN1080K against. Note that they may not belong to the same market segment. The relevant configuration details of the machines are provided so that readers have an understanding of why some benchmark numbers are skewed for or against the Zotac ZBOX MAGNUS EN1080K when we come to those sections. Note that we are using a new updated benchmark suite, and the number of benchmarks with comparison points is limited. Would be nice to see pictures of the graphics card and how it connects to the motherboard, HINT HINT. Is that GTX 1080 a mobile or desktop GPU? How is it cooled? It is a desktop GPU configured with a 175W TDP (as evident from the power component in the thermal stress section). > While we do have the option to enable SGX support, there are no control knbos for the integrated GPU in the Core i7-7700HQ. The integrated GPU is better at decoding videos encoded in codecs such as VP9 Profile 2 compared to the GTX 1080. It can offer the PAVP (protected audio video path) for certain DRM requirements that is also not present in the GTX 1080. Unfortunately, the integrated GPU is completely disabled in the EK71080 (this is no different from the previous ZBOX MAGNUS PCs, though). > We see that the system can't play back Ultra HD Blu-rays even if a UHD Blu-ray drive were to be attached to it. The main reasons are the absence of SGX support software, updated ME firmware, and the inability to make use of the Intel GPU's protected audio-video path for processing the Blu-ray streams. Do you guys not have a PC with desktop GPU to provide at least one such comparison.